It’s really hard to keep up with all of the shootings and the articles written about the American gun culture as it is revealed in front of our very eyes. Our leaders are abandoning their citizens. Actually most of us woke up long ago. It’s those who are afraid who are sleeping at the helm of public health and safety. It’s those who can do something about it who have allowed themselves to be placed in the pocket of a group that doesn’t seem to care about all of the shootings. For if they did, they would start supporting common sense measures- or, as one person I read recently said, just plain laws to keep us safe. Why do we have to say common sense when it should be an unspoken truth that our leaders will do all they can to protect us from things that can kill and injure us. They can’t protect all of us and they can’t stop all shootings but they sure as heck can get to work to stop some of the killings and act like adults instead of being led around by the nose by the ultra conservatives, the gun extremists and the gun lobby. 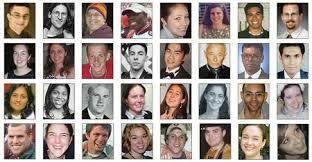 What does the corporate gun lobby (NRA) say about shootings of and by police, of GLBTQ Americans, women and children? Action is not on their calendar or their radar. Instead, Congress took a 7 week vacation while people continue to die. The Brady Campaign has it right in the meme I have included here. How many more people will die while our Congress doesn’t do their jobs? The Gun Violence Archive tells us that 2016 has been bloody. Our streets and homes have seen blood running in them. A speaker at a local Black Lives Matter event I attended on Friday and at which I spoke, stated the obvious. Everyone’s blood is red. Black people, brown people, white people and all people bleed red. The gun lobby doesn’t want us to think about any of this. Nor do they want us to do research about any of it. The likely findings will be that too many Americans are shot to death every day and it’s because of the easy access to guns and lax gun laws that allow for this to happen. It’s about a culture. It’s about guns. When will it stop? And when will we do something about it to get it to stop? He was right. We are living now in a country full of fear- fear of each other; fear of those who don’t look like us; fear of law enforcement; fear of black people; fear of white people; fear of the government; fear that if you don’t have a gun and someone else does, you are going to be at risk; fear that everyone is armed so then everyone needs to be armed to protect themselves from others who are armed. The gun lobby is profiting off of our fears. They are encouraging, to the tune of over $14 billion dollars a year, the arming of America. They are promoting fear of “the other” to get people to buy guns. And the result is an armed society where no one knows who is the good guy with a gun and who is a bad guy with a gun anymore. An armed society is not a polite society. Police executed a search warrant at Davis’ residence and found a loaded Hi-Point brand 9 mm assault rifle between the mattress and box spring of his bed, the complaint said. Officers said the serial number had been scratched off the weapon, which appeared to be fully automatic and fully functional. Fully automatic? Luckily that did not result in a shooting but it easily could have. These are our nation’s young people. What is happening in our country? Teens and guns are not a good mix. People have had #Enough. It’s past time to do something. We shouldn’t ban guns totally, as that would jeopardize the basic need of self-defense, but we should not give unlimited access to all sorts of guns in the name of the Constitution. Our neighbor Canada has restricted certain guns from civilian use. In the past year Canada had 172 deaths related to firearms, whereas the United States had 12,236 firearms-related deaths. We ought to follow our neighbor in restricting certain assault rifles and administering appropriate background checks. This way we can ensure the safety of our people and respect our constitutional right. How much, we need to ask ourselves, was Johnson responsible for these killings? And how much are our laws, our militarism and our elected officials responsible? If the United States is “the land of the free and the home of the brave,” does this mean we are free to shoot one another: white police shooting young blacks, unbalanced blacks shooting white police, husbands and boyfriends shooting wives and girlfriends, so many people shooting so many other people — and so freely? Not bravely, certainly, but cowardly. Indeed. Who is responsible? Not the over 90% who want reasonable gun laws. How about our leaders? How about the gun lobby? How about our culture of guns? They are right. They make more common sense than our own leaders. Why aren’t they saying things like this? Good question. Apparently they don’t have the backbone to stand for what is right. One woman killed and others injured in separate events in Minneapolis last night. 12 shot and injured near Cleveland in one night. Yes, you read that right. Cleveland where the Republican Convention starts tomorrow. 2 people are dead from gunshot injuries in St. Joseph, Missouri. Teens playing the latest game to hit American culture, Pokemon Go, sitting in their car playing the game experience shots fired by a man who got suspicious. Does one just shoot off one’s gun if one has even a little suspicion that something could be wrong before finding out or calling 911? When a gun is present, the potential is there for something bad to happen. 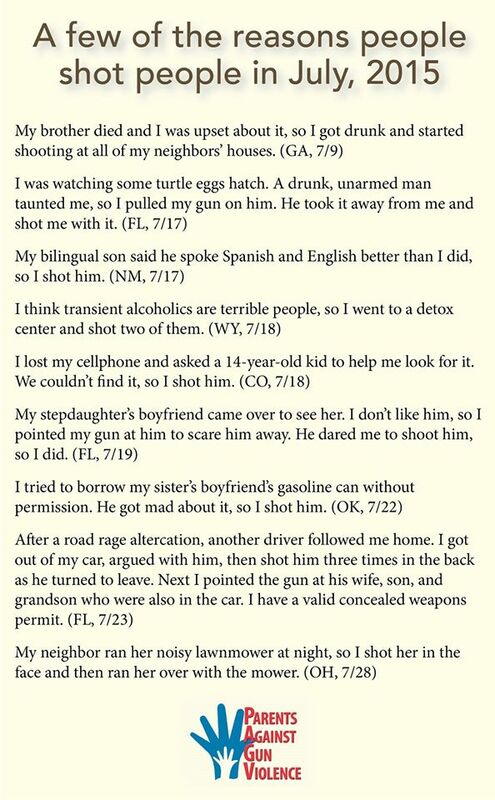 What does the gun lobby have to say about these? What does the gun lobby say about the armed citizens in Dallas who were mistaken for perpetrators when gunfire began, leaving 5 officers dead? What does the gun lobby say about the fact that a black man, Philando Castile, had a legal permit to carry a gun and when he told this to the Falcon Heights, MN officer. Who knows what that officer was thinking when he shot and killed Castile? We do know that officers assume that just about anyone could be armed when they make a traffic stop. At this point, there are many unanswered questions but one is why the gun lobby did not stand up to defend this shooting of a legal gun permit holder? And while we are on the topic of permits to carry, I have been talking to quite a few people about the fact that they get their permits to carry but they choose not to carry those guns around with them. Many of them said they like the training they get and they get their permits just in case they decide to carry. But for many reasons, they don’t want to carry- guns are heavy, they are hot, they get cold in cold weather, it’s inconvenient, it’s an awesome responsibility, and other reasons. So try as the gun lobby does to get everyone armed, they have not succeeded. It is about 4-5% of our population who have their permits to carry but many of them don’t carry a gun. The gun lobby is caught in a conundrum of their own making. When lies and deceptions have been foisted on us about the safety of all gun owners and how guns will protect us from harm and then they don’t, what is their answer? When people carry guns to protect themselves from others with guns, and get shot anyway, what is their answer? When police officers assume everyone is armed and then shoot someone who is armed for one reason or another (or potentially no good reason) what is their answer? When an otherwise supposedly legal gun carrier has access to military style weapons and targets and kills officers after the shootings of 2 black men, what is their answer? When the political party conventions coming up allow for people to open carry guns in the second layer of security and now everyone is worried about what could happen, what is their answer? The Cleveland Police union has asked for Open Carry in Ohio to be suspended during the Republican National Convention. Now we are seeing the results of what our corporate gun lobby has done to our country. Who can blame the officers? The head of one of Cleveland’s largest police unions is calling on Ohio Gov. John Kasich to temporarily restrict the state’s open carry gun laws during this week’s Republican National Convention following Sunday’s shooting in Louisiana that killed three officers and wounded at least three others. Governor Kasich says he doesn’t have the power to protect the officers and citizens by suspending Open Carry or even concealed carry at that ( which officers actually fear more) for the duration of the convention. Of course not. Even suspending the rights of some people ( a distinct minority) in order to save lives is not possible. Governors have tried to restrict voting laws, also Constitutional, and rights of women to exercise their Constitutional right to choose abortion, but guns? Not so much. Let common sense win. Officers lives are at risk. Was the Baton Rouge shooting an ambush? Are we at war? Everyone’s lives are at risk. This is the insanity of our American gun culture. Why should anyone carry assault rifles around in public wearing fatigues or dressed all in black? Who are they or who do they think they are? And body armor was apparently found on one of the suspects in Baton Rouge. Why is body armor available to citizens? There is no reason to buy it or wear it than to know you are going to need it in a shooting. Our country is experiencing a very bloody time right now. What are we going to do? Nothing is not an option. What will the gun lobby do now? Please don’t let them bring forth their tired old arguments about more guns making us safer or leading to a polite society or only good guys with guns can stop bad guys with guns or passing any law will lead directly to gun confiscation. Please. We just have to be better than this. It’s time to #DisarmHate and demand a safe society for our families, our children, our grandchildren, people of all colors, races, religions, sexual preference, law enforcement officers, women…..
We are weary of the news reports. We are tired of the shootings, the grief, the press conferences, the statements from politicians, the 24/7 news coverage, and we are afraid of the next national gun tragedy.